My memories of this holiday in Thailand already feel like a dream. Watching a movie on holiday feels like a dream within a dream. 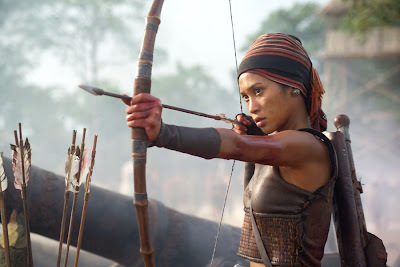 But I saw Part 2 of the King Naresuan trilogy during the opening weekend. It was released in Thailand cinemas on February 15th for the Chinese New Year holiday weekend. (My Part 1 review is linked here). Part 2 is 150 minutes long, but doesn't feel like it. About 10 years have passed since Part 1 of the story. Prince Naresuan is now a young adult. With King Bayinnaung of Hongsa (Burma) dead, the alliances he worked hard to maintain quickly start to fragment under the war-mongering rule of his son. 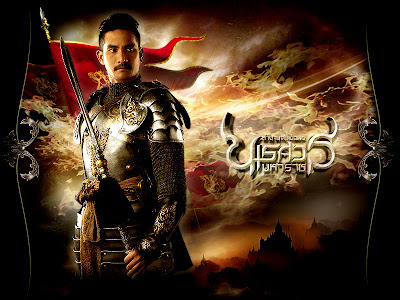 But the King was well-prepared, ensuring that Prince Naresuan, good at both warfare and wisdom, is still set to inherit the throne of Siam (now Thailand), hoping that he may be able to bring peace to the whole region. As the power game continues, now using brute force, it’s kingdom against kingdom. A simple insult can spark all-out war between territories. As the uneasy Hongsa alliance closes in on the mountain fortress of the rebellious King of Khong, Naresuan is unaware that some of his allies want him dead. As he joins battle for the alliance, his real intent is on freeing his people from Hongsa rule and returning them to their homeland. Most of Part 2 is warfare, 16th Century-style. There are occasional flashbacks to pivotal moments in Part 1, and enough room for an unlikely romance, but it’s mostly preparation for war and epic battles. Swords, muskets and cannons are the weapons of the day. Burning oil and arrows are optional. As an action film from the Far East, this is very different from what we’re used to seeing. It’s not like the flashy Chinese epics, where warriors have perfected their martial arts to the point of weightlessness, it’s just people fighting. There are no fighting styles, it’s just wading in with swords and trying to incapicitate the enemy. It’s more like the Japanese Kurosawa epics, where we see the force of numbers and the importance of strategy. Even so, there are no superhuman samurai here. There are a few warriors who can handle two swords simultaneously, but generally it’s bravery, tactics and the accuracy of the cannons that win. It doesn’t compete with the high-excitement of Hollywood action movies – the fight choreography and the stuntwork are solid but unexceptional, but this all makes it look more realistic. The importance here is the drive of the story and what happens to the characters. 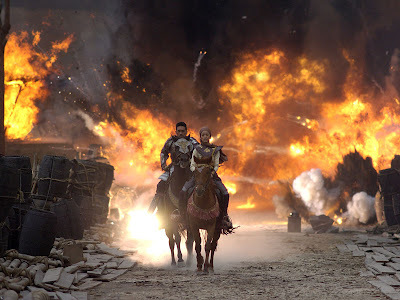 Having said that, the carnage of the cannon blasts was something that I’d not seen in a movie before – people and horses are sent flying in all directions. In short, this looks like an epic. Epic in scale and numbers, but without Hollywood’s reliance on far-fetched stunts and CGI. Just because you can paint a picture of an epic in a computer, doesn’t mean to say that you’ve made one. Epics are mounted. With large numbers of people, huge outdoor sets – I’ve not seen one so impressive since the 1960s. The sparse use of CGI makes this more convincing. The establishing shots have been extended in the computer, like traditional matte paintings, where real action is at the centre of frame. Digital compositing boosts the numbers of soldiers. The important thing here is that all the people you see are real - what you don’t get is unconvincing CGI people running around. Up close, buildings have been built full-size from scratch – there are no swooping shots around non-existent fake-looking structures. Mostly, the sets, the people (and the elephants) are all real. It looks fantastic. The character of the Prince starts off being boringly accurate in his battle strategies in the early part of the film. But even he starts showing cracks, like when his sister defies him. Thankfully, good advice is still available from his mentor the Head Monk, one of the best characters from Part 1. 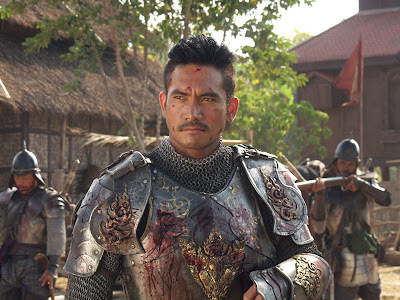 The adult Naresuan is played by Wanchana Sawatdee, actually an officer in Thailand’s royal cavalry! The director wanted an unknown to personify the legendary Prince, and a real-life actual soldier who could effortlessly ride a horse isn’t a bad choice. Like the three central children in Part 1, he's a newcomer to acting, but still convincing. Many other established actors had to learn to ride and fight (simultaneously!) and underwent extensive training, as did the extras. The violence is fairly family-friendly in tone, apart from some capital punishment dealt out to traitors (the hanging seen in some trailers), and one fight where blood sprays and heads come off - rather out of tone with the rest of the movie. Both entertaining and fascinating, the films breathe life into the roots of Thailand’s culture. The scale of these films are new highpoints in Thai cinema. Once more, I hope that they'll find a wider audience. They are the most expensive Thai films to date. I’m just worried that audiences will be put off by the lack of action in Part 1 and might then miss out on Part 2. The Bangkok Post review is here, but full of spoilers. UPDATE June 2007 - Parts 1 and 2 released on DVD and blu-ray in the US.